Sit down, Tom Selleck's mustache. 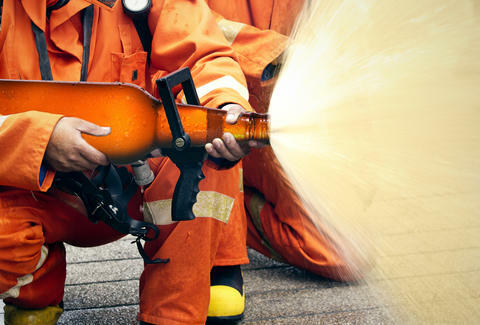 We used to think you were the manliest specimen to walk free American soil, but then a firefighter doused flames with beer, and he is obviously our new hero. Fire Captain Craig Moreau -- no relation to the creep with the island -- was off-duty and driving home to Houston with his wife when he spotted a burning 18-wheeler. Moreau pulled over and tried to help the driver put out the blaze with a small extinguisher, but the fire only flared up a second time. Moreau asked the driver what was in the truck bed, and that's when genius struck. The precious cargo turned out to be beer, so Moreau instructed the driver to start grabbing cans, which they both proceeded to shake and spray into the fire until it drifted into tipsy dreamland. Some good brews might've perished in the flames that day, but at least they died in the name of one ridiculously badass story that should be adapted into a movie starring Tom Selleck.